View More In Tank Bags. The refined Enduro Tank Bag will fit virtually all dual sport and Enduro bikes, from the Suzuki DR650, DRZ400, XR 650L, the KTM EXC's, the WR250R, and most bikes in between. A 4-point quick release mounting and no-skid/no-scratch pad keeps the Enduro Tank Bag in place during the most aggressive riding. The innovative design allows the bag to sit on the tank and not interfere with the gas cap or the vent hose. 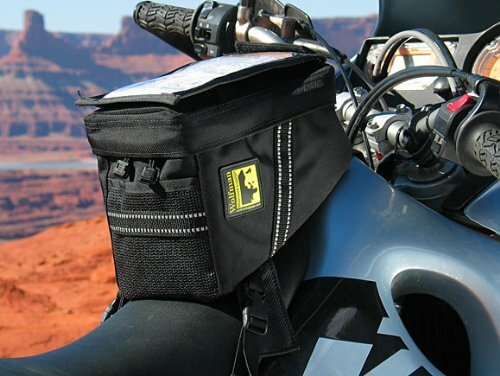 The mounting harness is the same for the Enduro Tank Bag, the Enduro Pocket and the Small Expedition Tank Bag. Easily swap between the bags as your needs change - without changing the harness. The foam structure gives the Enduro Tank Bag "Soft-Rigidity", allowing the bag to flex. Heavy Duty 1680 Denier Ballistic Nylon construction. Easy to find yellow cord on main opening zipper sliders. Heavy Duty #10 YKK main zipper, and YKK zippers used throughout the bag. The foam structure gives the Enduro Tank Bag "Soft-Rigidity", allowing the bag to flex. The silver interior makes it easy to see the contents of the bag. 4 point quick-release universal mounting system. If you have any questions about this product by Wolfman, contact us by completing and submitting the form below. If you are looking for a specif part number, please include it with your message.